The annual wild horse and burro sale and adoption is returning this month to the grounds of the Rio Grande Valley Livestock Show in Mercedes on Jan. 12 and 13. The annual wild horse and burro sale and adoption is returning to the grounds of the Rio Grande Valley Livestock Show in Mercedes. The Bureau of Land Management is bringing a combined 35 burros and horses — including mares, geldings and yearlings — for a two-day adoption and sale event. The event will occur from noon to 6 p.m. Friday, Jan. 12, and from 8 a.m. to noon Saturday, Jan. 13. The BLM gathers a certain number of wild horses and burros from public lands each year and offers them to the public for adoption. These efforts, according to Crystal Cowan, wild horse and burro specialist for the BLM, keep the wild herd population from doubling, which would otherwise occur every four years. If left to roam freely in the “wild” west, these animals can suffer from the desert-like conditions and eventually run out of forage and water. “They transition well,” said Cowan, who has helped lead many of these animals to a happy, healthy home. “I always say 15 minutes a day is worth more than five hours on Saturday,” said Cowan, regarding how their human companion can help ease the transition and create a bond. Last year, the BLM had one of its most successful adoption events in the history of the organization, which since 1973 has placed more than 235,000 animals in approved homes across the country. Oftentimes, she said, the horse will be the one to determine their adopter via gestures. 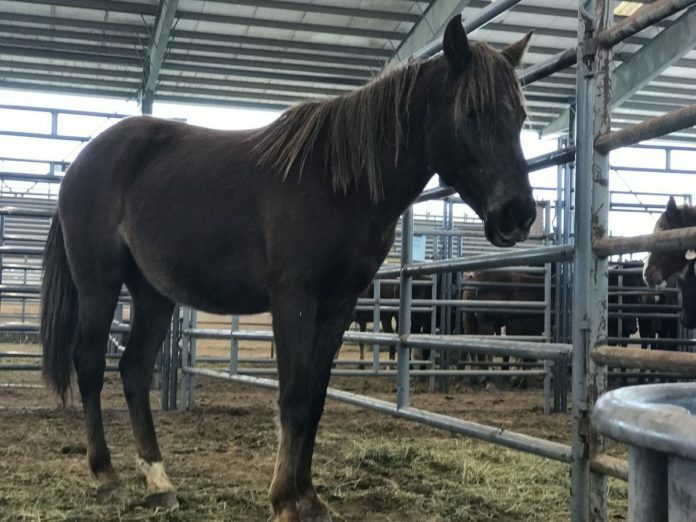 Some of the “living legends” making their way to Mercedes have been pulled from public lands of the west as far as Oklahoma, Nevada, Utah and Wyoming. Requirements for the adopter include being over 18, having a minimum of 400 square feet of corral space per animal, providing access to shelter and water, and with height requirements for fences ranging from burro to horse (with size considered). Fees for adoption will range from $25 to $125. Direct purchase will also be an option for some of the “living legends” brought. This is the first time the BLM is offering that alternative, which serves those who desire not to adopt from the federal government. Through purchase, buyers are not required to go through a certification process. Adopters and buyers the organization has seen in years past vary greatly. Cowan cited “huge range of folks” who might wish to fulfill a lifelong dream of owning a horse or burro, desire a pet, or want to use the animal for competition or ranching. “I just want them to come and go home with a horse that they want and give it a good home,” said Cowan. She encouraged anybody considering, but perhaps hesitant about, adopting or purchasing one of these animals to go by and ask questions.